Lovely south facing home has 3BR, 2BA & approx. 1850 SF of comfortable living. Located on a desirable cul-de-sac. 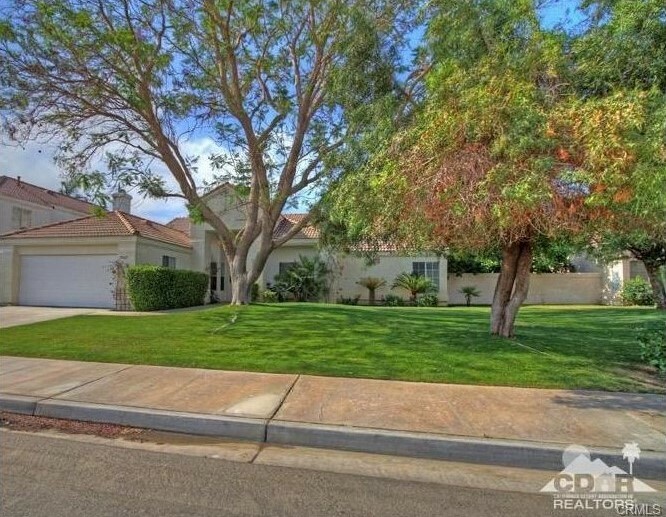 Close to the only IB schools, Amelia Earhart Elementary, John Glenn MS & La Quinta HS. Sunny kitchen w/double ovens & adjacent to the eating area w/views of the sparkling pool/spa & surrounded by lush landscaping including fruit trees, 6 palm trees & mountain views. Great room has a fireplace, media/display niches, soaring ceilings, French doors to backyard & surround sound throughout. Newer AC/furnace has a 8 yr. warranty. There is a formal dining room too! Expansive master BR has French doors to the entertainer’s backyard; master bath has dual sinks, tub & separate stall shower & walk-in closet! Guest room w/full bath. Minutes to the new Century Movie Theater (ready by year-end), excellent restaurants, major retailers, shops & minutes from College of the Desert. This is the perfect home to entertain!